This unique text presents a thorough introduction to Mastercam X8 Lathe for anyone with little or no prior experience with the software. It can be used in virtually any educational setting -- from four-year engineering schools to community colleges and voc/tech schools to industrial training centers -- and will also serve as a reliable reference for on-the-job use or as a self-study manual. The award-winning author has carefully arranged the contents in a clear and logical sequence and has used many hundreds of visuals instead of wordy explanations. He has also provided exercises from the text for student practice. Emphasizes student-friendly visual displays in place of long explanations and definitions. Uses numerous examples that provide step-by-step instructions with visual displays. Covers all aspects of using Mastercam X8 to machine various types of parts and contains a process plan describing the machining operations to be carried out to machine each part. 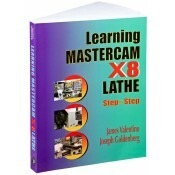 The enclosed CD contains the complete Mastercam X8 Demo, as well as student practice exercises from the book. The authors are recipients of the prestigious M. Eugene Merchant Manufacturing Textbook Award, presented by the Society of Manufacturing Engineers in recognition of the year’s most outstanding manufacturing-related textbook. They received this award for their Introduction to Computer Numerical Control (Prentice Hall). James Valentino holds a doctorate in applied mechanics from the Polytechnic University of New York. He has over 30 years experience teaching technology courses and many years experience in industry. Formerly, he was professor and chairperson of the department of Mechanical Engineering Technology & Design Drafting at Queensborough Community College (CUNY). He is a member of Sigma XI and a senior member of SME. Joseph Goldenberg is a mechanical engineer with over 40 years experience as a machine tool designer, CNC programmer, manufacturing manager and college professor. Professor Goldenberg is a full-time faculty member in the department of Mechanical Engineering Technology & Design Drafting at Queensborough Community College.